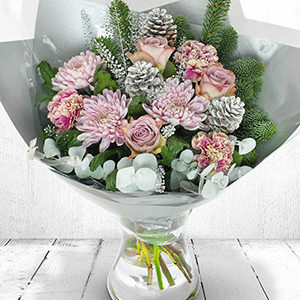 A divinely pure white Christmas Aqua-pack Bouquet featuring Roses, Chrysanthemum, Carnations and pretty white baubles. …let it snow, let it snow. 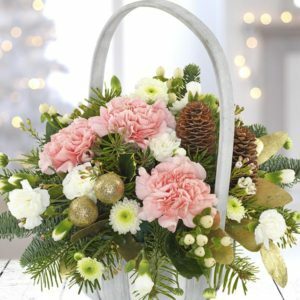 This beautiful hand-tied bouquet is a combination of blush pink roses, with white carnations, white alstoemeria and hypericum is brought together to create the perfect Christmas scene. Presented in a charming cream flower bag, and crafted by one of our expert florists to create the ideal Christmas gift. Treat a loved one today and show you care at Christmas. 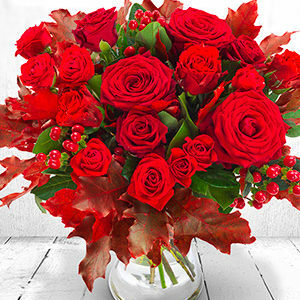 A luscious aquapack handtied bouquet of mixed red roses paired with hypericum, the perfect way to show someone you care. 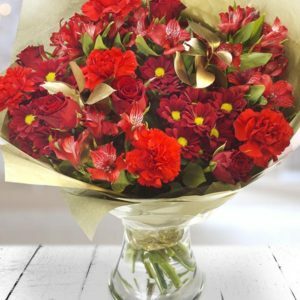 Make Christmas cosy with this luxurious red handtied aquapack, made of carnations, roses, santini and hypericum, decorated with pine cones. Please note the Reindeer is not included. 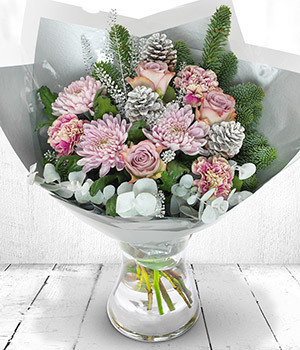 Crispy silvers, deep greens and frosty Carnations make up this delightful snow themed bouquet. Finished off with some frosted pine cones and soft pink Memory Line Roses so it looks like freshly laid snow. White Oriental Lilies and deep red Naomi Roses make up this Christmas mix which is themed around a guiding star in the darkness. 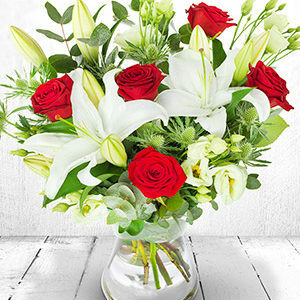 The crisp white lilies are complimented by the rich red roses and the glittered Cinerea. A charming Christmas bouquet. It’s Christmas, all wrapped up. 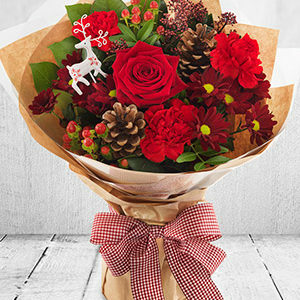 An elegant bouquet that combines each of the traditional colours of Christmas to create a real Christmas cracker. 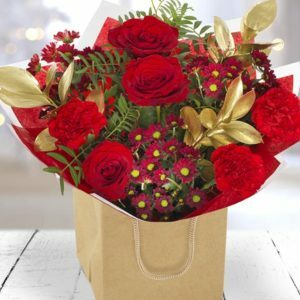 Presented in a bag, these luscious blooms are couriered directly to your recipient to deliver Christmas cheer this season. 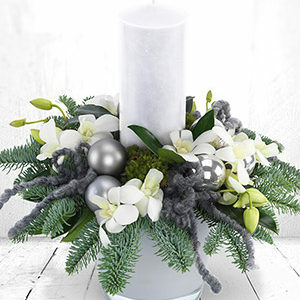 Light up someone's day with this simple yet stunning candle arrangement in greys, whites and cream dendrobium, ball moss and nobilis. 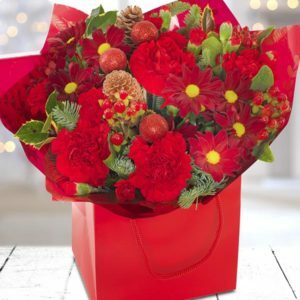 These festive blooms tell the story of Christmas perfectly, a delicate combination of red carnations, berries and chrysanthemums, with festive foliage. Nestled in amongst the flowers are subtle red baubles, giving an element of sparkle to this Nativity scene. 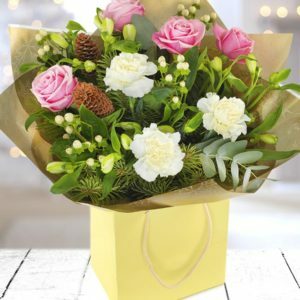 Hand delivered and crafted by one of our expert florists, order before 3pm for same-day delivery and make the festive season sparkle. Pure and simple. This white basket arrangement is hand crafted and delivered by expert florists using the finest stems of eustoma, roses, Santini, ruscus and galax. 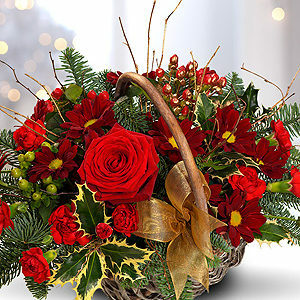 A gorgeous ruby red Christmas flower Basket bursting with Roses and Carnations with a flourish of Holly, Hypericum berry and Blue Spruce. This festive basket is packed full of Christmas cheer. 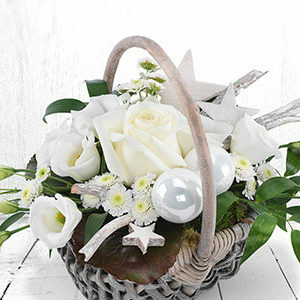 Discover this beautiful arrangement of festive florals, put together lovingly and arranged in a whitewash basket to bring these blooms to life. A Winter’s Tale is the perfect gift this Christmas, bringing a touch of sparkle to the lucky recipient.